Build a simple and cheap cable for programming new series ATMEL 89S51/52/53/8252. New layout made with single-side PCB. 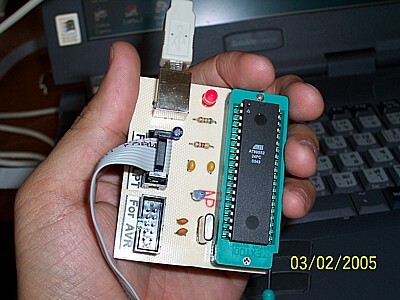 I have modified Asim's ISP loader to be a simple hardware for programming the new series 89Sxxxx MCU from ATMEL. I tested program 89S51 and 89S52 with new version ISP V3.0a, it works very well. However as the circuit designer, I would suggest to add the buffer chip between LPT port and target MCU. You may learn the exemplary design, loader cable with 74HCT541 for buffering SPI signals by Asim Khan. I haven't got such chip at that time, so I tied the SPI signal to LPT port directly. For beginner please try with Asim's hardware. I asked my student who just finished the class on using Orcad to draw schematic and layout helping layout the board. Below is a nice single-side PCB for cheap cable Asim loader. Here is complete hardware schematic.